Alberta Darling is a Republican State Senator representing Wisconsin's 8th District (River Hills) as of 2012. On May 31, 2011, ALEC members Sen. Alberta Darling, Sen. Sheila Harsdorf, and former Sen. Randy Hopper (along with Sen. Luther Olsen, who has not been identified as an ALEC task force or other member), introduced a motion to the Wisconsin budget bill to give a big tax break to a big tobacco company. As part of that effort, they voted to convert the tax on moist tobacco products from a price-based tax to a weight-base tax. Moist tobacco products, like Skoal, Copenhagen, and a new candy-flavored tobacco pouch called "Snus," would benefit from this tax break. The tax change would lower the price of the smokeless products that target kids with packaging and candy flavors. Darling is a member of the American Legislative Exchange Council's (ALEC) Commerce, Insurance and Economic Development Task Force. She used $200 in taxpayer funds to pay her ALEC membership dues, according to One Wisconsin Now. Sen. Darling is an alternate on the ALEC Tax and Fiscal Policy Task Force. In the 2011-2012 legislative session, Sen. Alberta Darling co-sponsored 9 bills that reflect ALEC models, according to an analysis by the Center for Media and Democracy. In June 2010, late in the debate over the Wisconsin state budget, Darling and five other Republican legislators in the Joint Finance Committee "sponsored a proposal to lower the overall price of moist snuff [tobacco] like Copenhagen and Skoal. Specifically, the provision would have altered the tax on smokeless tobacco products from one based on the price of the tobacco to one based on weight," according to the Milwaukee Journal-Sentinel. The change in taxation was nearly identical to a proposal put forth in an ALEC "model bill." 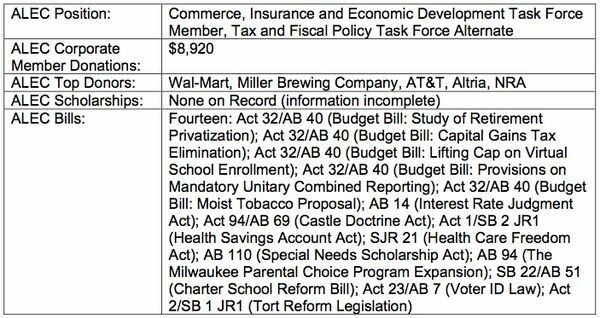 According to the Journal-Sentinel, "On the moist tobacco proposal, an ALEC staffer even wrote to the governor to ask him not to veto the item after it was inserted in the budget bill. Sen. Darling supported Governor Scott Walker's Budget Repair Bill (Act 10) that curtailed collective bargaining for public employees. ↑ 3.0 3.1 3.2 Dan Bice, Liberal organization links Wisconsin bills to Koch-funded group, Milwaukee Journal - Sentinel, July 13, 2011. ↑ 4.0 4.1 2011-2012 Committee Assignments, Alberta Darling legislative website, accessed Aug 1, 2011. ↑ Maplight.org, Alberta Darling / Altria contributions, Nov. 9 2010, accessed Aug 1, 2011. ↑ Gail Sumi and Maureen Busalacchi, Veto Tax Break for Big Tobacco (op-ed), Milwaukee Journal-Sentinel, June 21, 2011, accessed Aug 1, 2011. ↑ Scott Bauer, Walker to Veto Tax Change on Tobacco, Drawing Praise from Health Groups, Associated Press / Capitol Times, June 24, 2011. ↑ 8.0 8.1 Alberta Darling bills 2011, Wisconsin legislature website, accessed Aug 1, 2011. ↑ Alberta Darling website, accessed Aug. 1, 2011. This page was last edited on 4 October 2017, at 20:02.